I’m posting over at Proverbs 31 Ministries’ Encouragement for Today. I thought this might be an encouragement for you too. God sees what you’re going through! One day I was sitting on the patio with my new stepfather, Pete, waiting for the grill to heat up before placing steaks on to cook. My mom opened the door and gave Pete his orders — telling him what to do and how to do it. When she went back inside, Pete made a hand signal, pointing in one ear and out the other. We both laughed. Then he placed his ruddy hand on my arm, a hand worn by years of working under the hood of cars of every make and model. “You have no idea,” I answered with a sigh. But Pete did have an idea. He understood. And that one simple gesture let me know he had peered into my heart and seen the truth. The weathered, country mechanic had looked under the hood of my heart with wisdom and seen the damaged engine within. A heart that, though healed by Christ, still felt the phantom pains of a little girl who felt she was never good enough, who was constantly told what to do and how to do it — and who never did it quite right. Pete saw my heart, and for that, I loved him. That’s exactly what happened to a woman named Hagar. In Genesis, God had promised Abram he would be the father of many nations. But then his wife, Sarai, grew tired of waiting on God to fulfill His promise. So she told Abram to sleep with her slave, Hagar, and build a family through her. (Genesis 16:1-3). Once Hagar conceived, Sarai grew jealous and mistreated Hagar. Hagar couldn’t take the abuse any longer, so she ran away to the desert. ‘I’m running away from my mistress Sarai,’ she answered. Then the angel of the LORD told her, ‘Go back to your mistress and submit to her.’ The angel added, ‘I will increase your descendants so much that they will be too numerous to count’” (Genesis 16:7-10, NIV). Hagar’s heart was humbly moved because God had seen her, taken notice of her, understood her. “‘You are the God who sees me,’ for she said, ‘I have now seen the One who sees me’” (Genesis 16:13b). Hagar called God by His name, El Roi, The God who sees me … and you. The book of Hebrews tells us we have a High Priest, Jesus, who understands what we’re going through. He “sympathizes” with our weaknesses (Hebrews 4:15). The word “sympathizes” comes from two Greek words, syn and pathos, meaning, “suffer with.” We are not alone in our suffering, and there are glory moments, moments when God makes His presence known, if we keep our eyes open to see. Click & Tweet! 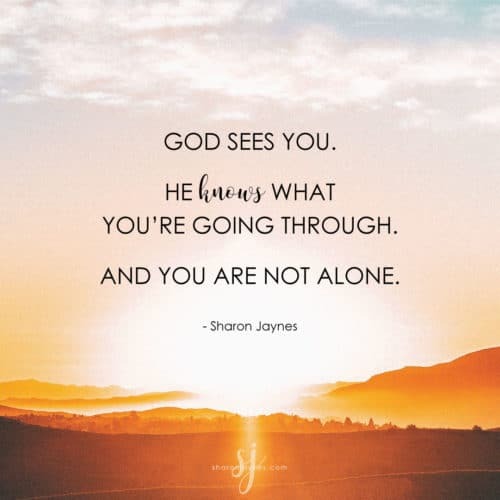 I don’t know what you’re going through today, but I do know this: God sees you. He knows what you’re going through, and you are not alone. Click & Tweet! Dear Lord, thank You for seeing what I’m going through, every single day. Remind me of this truth in good times and bad. Help me experience Your goodness and Your glory in my life today. In Jesus’ Name, Amen. Glory moments abound when we tune into God’s frequency and listen. What is one way that God has spoken to you lately? 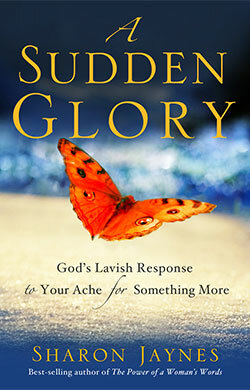 Today’s post was adapted from A Sudden Glory: God’s Lavish Response to Your Ache for Something More. Do you long for something more in your relationship with God? The good news is that “something more” does not mean “doing more.” It’s not about what God wants from you, but what God wants for you — to experience Him in the middle of your busy, messy day. If you have a “glory ache” — a longing to experience God on a daily basis, then this book is for you. I’m glad see me and will meet me were I’m right now. That he will lead me to were he want me to be but I most stand on his promises made to me. I so love God and need His help!!!!! Thank you God for All You do. Thank you for this message it came at a perfect time. God knew this is what I needed right now. My circumstances are so painful and I need his wisdom desperately to say and do the right thing during this storm happening between my daughter and getting help for my granddaughter. I give praise to God being with me.. This post came at God’s perfect timing. My youngest sister died this morning after 10+ years of battling cancer. I felt alone, forgetting that God is constantly with me and feels my pain. Thank you! He does see and He used your devotional to let me know, today. Just having a rough day at work and feeling that I cannot do everything that is expected of me, no matter how hard I try. Thank you for being “Jesus with skin on” to me. As I read, and re-read, this post, all I want to do is sit and cry. I believe God sees, but I struggle with the faith it takes to get me through to believing that He really does care. I’m at a loss as to what to do next other than just the little bit I’ve been doing while I wait for Him to sort out all the rest. Either I will have a marriage that He desires for me to have or I’ll continue to exist in the marriage I’m in. Stay strong..I’m there. I have been going through a rough time in my marriage also forany years. Many..even Christian friends..tell me to end it. But, I know the Lord keeps telling me to hold on…that he has a plan. I receive the Proverbs 31 Ministries Encouragement for Today devotions daily in my email. On Friday, November 30th, I was headed to yet another scary health procedure that I had to endure. As I walked up to the building, wading through small puddles of water in the parking lot, I said to myself: I hate being sick. I hate going through these things constantly, When I entered the medical building and waited on the elevator, I heard someone announce over the loud speaker. Code Blue-Cancer Center. I dropped my head as I realized that not only was a cancer patient suffering with that dreadful illness, but they were going into cardiac/respiratory arrest at that time. I was immediately convicted and prayed for them. As I sat in the waiting room, I pulled up my email to read the devotion for the day. That is when I saw your devotion. I knew what that moment was. It was a glory moment that God was showing me. Twice before-in this same medical office building-he had given me glory moments. My pastors wife with their critically ill son, whom doesn’t complain and another friend from church who lost her mother to cancer when she was 18. She had just written a children’s book on how children cope with the loss of a parent. Yes, these were the glory moments that God sent me to let me know that He sees me and that he suffers with me. Don’t complain or feel sorry for myself because I am not forgotten. When I left that medical appointment, the receptionist told me that I had a credit on my account and did not owe anything that day and that the doctor would not need to see my until January. He is El Roi! Great reminder. God DOES see us and care about us! I am in need of prayers please! I am going through a tough time right now. I pray for my prayers to be answered and peace be restored to my soul and heart. My marriage to continue to grow in strength through Christ our Savior. Thank you so much for sharing all your encouraging prayers and devotionals! They are so inspiring and uplifting that I cannot keep them for myself. Sharing with others, and encouraging others has been encouragement for me as well! May God continue to bless you and keep you as your ministry continues to help all those in need. In Jesus Name I pray…Amen! I have read some of the comments and I see that I am not alone. Last year was a very terrible year for me in my marriage. I have been married for 18 years and my husband has seem to have made a 380 degree turn towards being unconcerned, not as attentive and I just feel I cant do it anymore. I keep waiting on God to show me a sign. But I will continue to pray. This Was Very Interesting The Title Struck A Chord With Me. I have been Struggling Some Time With A Situation In My Life, & On 2 Occasions I Felt The Presence Of God Reminding Me That I Am Not Alone & Reminding Me Of Just Who I Am. The 2 People I Encountered They Had Such A Warm Presence & The Words They Spoke To Me I Knew God Sent Them To Remind Me Of How He Is With Me & How To Stay In Faith To Keep Believing In Me & That I Am Never Alone.